Switch/bloc is a new innovative development just south of the heart of 17th Avenue's shops, restaurants and lounges. It's located in the heart of Calgary’s most popular historic neighbourhoods, directly across from Edwardian-Era Anderson Estates apartment block. With the use of cedar shake, and dormer windows, the modern design of Switch/bloc has still kept true its surrounding as the appearance has been designed to pay tribute to the historic character of the area. Switch/bloc is a low-rise, four storey condominium development with a total of 19 units. 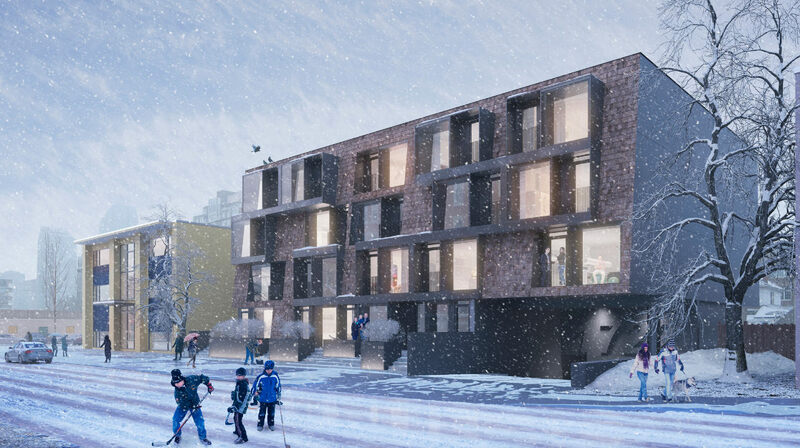 Its forward thinking design by MoDa, wraps two condo units around one another over 2 levels, which gives it the advantage of functional floor plans. Spread over 2 floors, the kitchen, living and dining areas are situated to the front of the building and the more private resting areas are located in the rear. This layout will give you the feel of a townhouse/single family home. You can now wake up in the morning to the sunrise, and enjoy the view of the sunset in the evening from your living room windows. The stacking of the units also eliminates long corridors giving it a highly saleable square footage of 95 percent. Other features include the 9 foot ceilings in principal rooms, floor-to-ceiling windows and individually controlled in-floor heating. Units are currently pre-selling so you don’t want to miss out living in this well located, innovative condo. For further details, pricing, available units, floor plans or to check out the show suite, just fill out the form below and we’ll be happy to provide you with the required information and buyer’s package.